The Proprietress of Bill Clinton College, New Nyanya, Nasarawa State, Mrs. Maureen Iornumba, has stated that her daughter has become an anti-corruption activist in the family since she became a member of the Independent Corrupt Practices and Other Related Offences Commission’s Students Anti-Corruption Club (SAC). Mrs. Iornumba made the revelation at the one year anniversary celebration of the college’s SAC. She narrated how her daughter has been preaching the gospel of integrity to members of the family and cautioning everyone at every turn on what she considers as acts of corruption. She said the little girl has been so zealous and persistent that family members have had to bow to her wishes by complying and watching what they do and say in her presence. 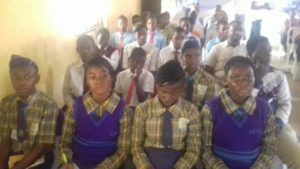 On the progress of the club itself, the Proprietress explained that at the beginning the students of the school were reluctant to join it because of the “dos” and “don’ts” but through the doggedness of the Coordinator, they have weathered the storm and now have a lot of members. She noted with gratitude how ICPC has been very supportive of the college’s desire to instill a culture of honesty and transparency in the students at their formative stage. In her remarks, ICPC’s representative, Mrs. Azuka Ogugua of Education Department, spoke to the students on the importance of integrity. She therefore called on them to “make integrity your first name”. One of the speakers at the event, Mrs. Bukola Adewumi, who is also the winner of the 2018 Integrity Idol Nigeria Award, charged the students to avoid acts that would put their character to question. The event also featured entertainment as the students thrilled members of the audience to songs, drama presentations and poetry recitations which had anti-corruption themes embedded in them.